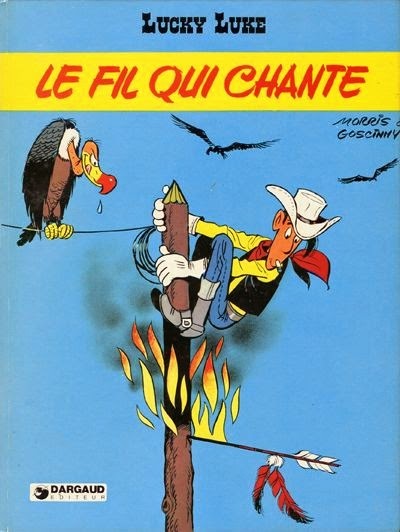 I didn't appreciate it when I was young, a least not consciously, but Morris and Goscinny make Lucky Luke seem so effortless. The words and picture work so well together. They combine seamlessly into a fun yet informative narrative. It's professionals at work and it makes for a really fun read. The effortless storytelling translates to a breezy read. But Lucky Luke manages to have substance too so it doesn't feel like a throwaway comic. James Gamble, an engineer, is given the task to bring the telegraph wire from Carson City to Salt Lake City and completing half of the First Transcontinental Telegraph. Lucky Luke, recently put out of a job with the Pony Express due to the telegraph, is hired to protect Gamble’s team and help out wherever he can. There is a second team whose job it is to install the singing wire from the east coast all the way to Salt Lake City where it will join up with the wire installed by Gamble’s team. Morris and Goscinny give the plot a bit of weight by having the team strike a bet: the team who makes it to Salt Lake City first will get $100,000. This obviously makes Luke’s job much more difficult since he’s now convinced that there is a spy within Gamble’s team and he’s right, of course. The setup is done in just a handful of pages and the rest of the album focuses on the journey from Carson City to Salt Lake City. Gamble’s team encounter numerous challenges, some natural, some logistical and quite a few caused by the traitor. Many of the situations are humorous and the overall tone is light-hearted. Goscinny maintains some suspense with the mystery of who the traitor is and the reveal is pretty satisfying considering the length of the comic. The jokes are regularly predictable but I’m not sure if that’s because I read it numerous times before or if it’s truly obvious where the jokes are coming from. I don’t think it really matters because seing it happen on the page is still enjoyable, in great part due to Morris’s expressive cartooning. Le fil qui chante is good fun and it’s guaranteed to please and it’ll certainly make you smile. It’s a fine example of an all-ages bandes dessinées. My review is based on the French edition published by Dargaud in 1977. 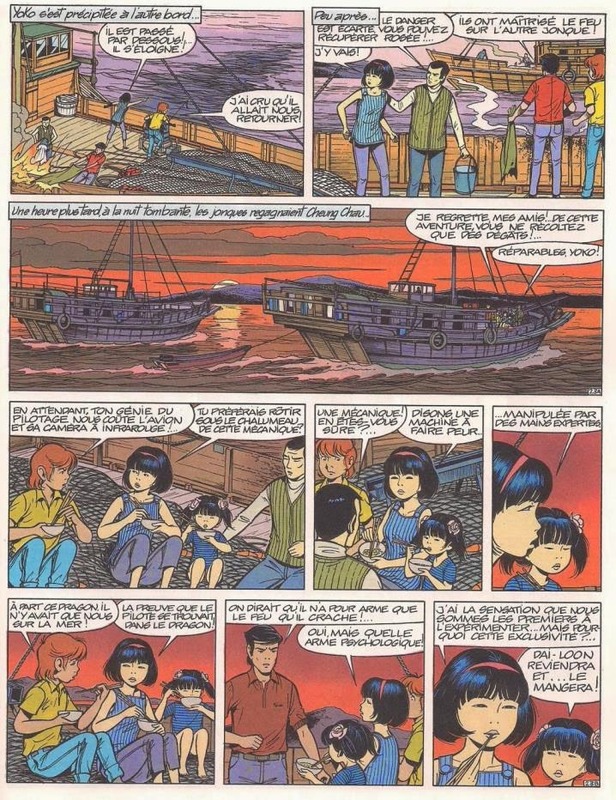 There are three main types of Yoko Tsuno stories. The first kind involve her background as an electrical engineer to tell cutting edge (for their time of publication) science centric stories. Those stories often have science fiction elements but they’re grounded in the real world thanks to Roger Leloup’s crisp and detailed art. The second type of stories are pure science fiction often involving the Vineans, technologically advance blue skinned humanoids. The third type of stories are the time travel stories. After writing La Spirale du temps (The Time Spiral), Leloup revisited Monya and her time machine in several other time travel stories. It doesn’t sit perfection in either of the two types of stories because it has an important science fiction element to them but they’re also ground in reality (either the present or well researched representation of the past). As such, I consider those stories to be a separate type. 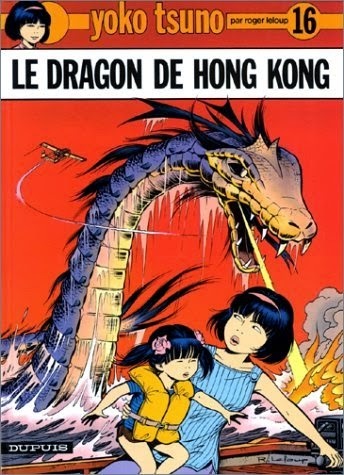 Le Dragon de Hong Kong, published in 1986, is one of the Type-1 stories. The story jumps right into the thick of it and by the second page Yoko is already acquainted with the dragon of the BD’s title. She is in China to visit her cousin and decides to make a trip to Hong Kong (alone, because her cousin doesn’t like the bit city). After a tooth is left behind in the junk’s wooden banister, Yoko takes it upon herself to uncover the mystery of the dragon’s origins. Overall, the story is simple but what’s impressive here isn’t really the story itself (though there is nothing notably bad about it) but Leloup’s masterful skills as a storytelling. I was particularly impressive by the pacing of the comic. It’s plotted very well and the story moves very briskly while also maintaining a certain rhythm that allows for ease of reading and enough time for the reader to enjoy the artwork. There really isn’t a single wasted panel in the whole comic and it’s filled with detective-like investigating, human story elements (a bit of Yoko’s family history and the beginning of her own family), action both high-tech and low-tech and everything wraps up in a final page that is both heart-breaking and heart-warming. As always, Leloup’s art is one a treat. One of the best things about Yoko Tsuno is Leloup’s attention to detail. It’s quite spectacular how he can convey so many realistic depictions of buildings, people, machines, and boats. Most of the art is done using a single-width ink line. Because the inking is so uniform everything is given a more equal importance on the page. Leloup still maintains focus on the characters and the action, but everything is drawn with equal attention to detail and it helps to immerse the reader into the real-life settings of the story. He changes his inking a bit for the dragons, likely in order to convey the scales more realistically. It also helps to make them stand out more from the rest of the art. He also used another technique to make the scenes with the dragons pop, that of using larger panels. Le Dragon de Hong Kong is entirely made up of pages that have three or four tiers. The four tier pages are used for the non-action scenes and they mostly serve to advance the plot or develop the characters. The three tier pages are used for the action. This allows for larger panels which is necessary to show off the Hollywood blockbuster-like action. There is a noteworthy real-life parallel between Leloup’s live and that of his heroine, Yoko. This album is dedicated to Keum-Sook, Leloup’s adoptive daughter of Korean descent. Yoko adopts her own daughter in this story and Rosée du matin, the little girl in question, will become a staple character of the series from that point on. It’s actually quite nice to see Yoko evolve so gracefully into this new role but it’s not surprising given her easy relationship with other children previously in the series. 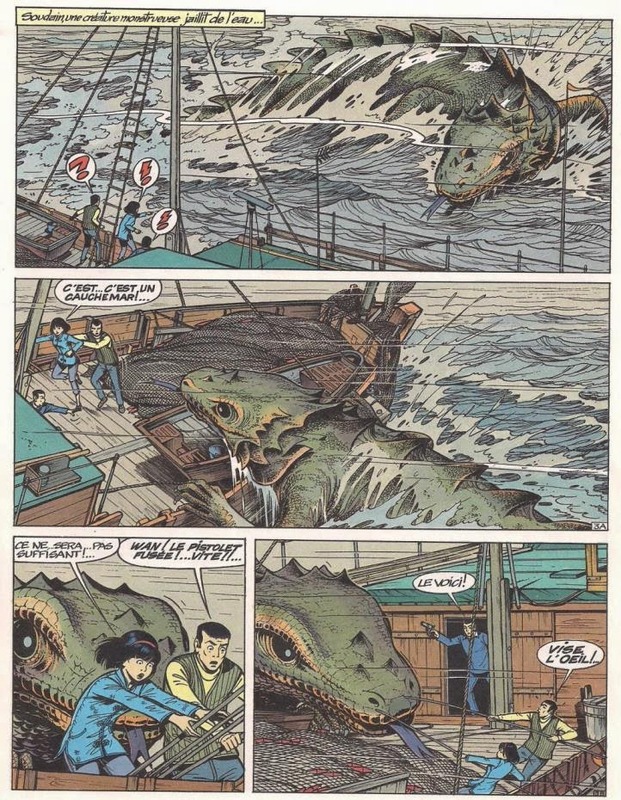 Le Dragon de Hong Kong is a typical Yoko Tsuno story, which means face pacing, stellar art and an interesting lead character. It was good when I was a boy and it’s still very good now. My review is based on the French edition published by Dupuis in 1986.